DURHAM – Paying it forward and paying it back is the philosophy behind “Survivor” winner Bob Crowley’s latest venture, a nonprofit organization called the Durham Warriors Project. 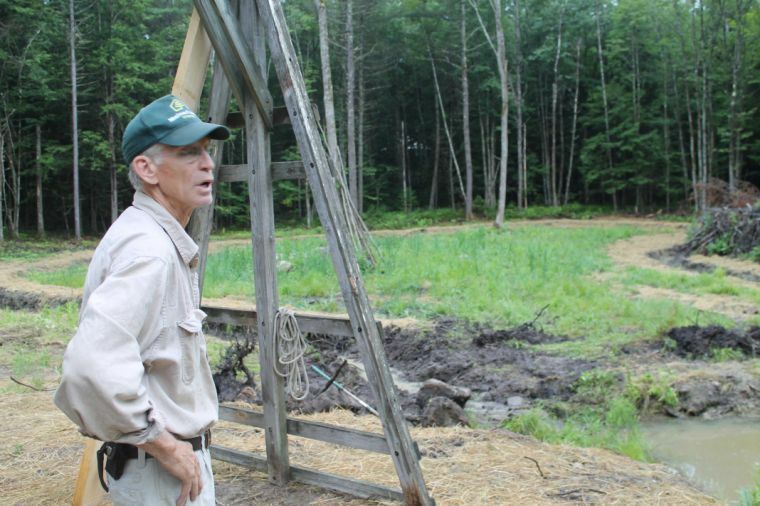 Located on Crowley’s sprawling 100-acre Durham property on Runaround Pond, the Durham Warriors Project’s goal is to cover the costs for veterans, active duty military, and other deserving individuals to stay for a weekend at Maine Forest Yurts, Crowley’s eco-friendly retreat, located on the same property. The idea to offer free accommodations to veterans came from a conversation Crowley had with his wife, Peggy. “We thought it would be a great project to honor our servicemen and women,” said Crowley. Though the fundraising efforts have been modest so far – the Crowleys have hosted four families as of August – the project is set to kick into high gear with the first Durham Warriors Project Survival Challenge, a four-day competition/fundraiser where contestants compete in a series of 17 challenges. It will basically mirror the style and format of “Survivor,” the long-running CBS television reality show, which vaulted South Portland resident Crowley from a bow-tied, bespectacled Gorham High School physics teacher to fame and a $1 million win in 2008. The challenge will take place from Thursday, Sept. 5, through Sunday, Sept. 8, and feature 18 contestants, who will pay $250 to enter, from around the country. Their identities are being kept a secret, but may feature prior “Survivor” contestants who will take part in a pre-competition testing of the challenges, said Crowley. The event is capped at roughly 100 participants and spectators, but Crowley hopes to have footage available via You Tube or the Maine Forest Yurt Facebook page. For Arizona resident John Vataha, a self-described “Survivor” nut who is helping to organize the four-day event, Crowley’s nod to veterans is an example of thinking outside the box. On a morning last week, Crowley was still preparing and designing challenges, a closely guarded secret, he said. The “Survivor” format will be accelerated from the typical 39 days to the four, but will have all the hallmarks of the show – including the dousing of the flame to signify a departing contestant who has been voted out, a tribal council, and the separation of contestants into three tribes. Immunity challenges will provide a tribe with immunity from the dreaded tribal councils, said Crowley. “I have the dimples,” said Crowley. Crowley has the distinction of being the oldest and perhaps unlikeliest winner of the “Survivor” show when he outwitted his fellow contestants at the age of 57. ‘Bob is no physical specimen and a little eccentric, “ said Vataha, who has tried out unsuccessfully for the show since the second season. Known for his ever-present bow tie, Crowley has held a wide range of jobs, from being a first mate on a research boat for the Smithsonian Institution in Canada, an entomologist for the U.S. Department of Agriculture, to a skunk relocater, as well as president, vice president and chief negotiator for his local teachers union. After winning the $1 million prize in 2008, Crowley has primarily hit the speaking circuit, and donates his time to groups such as the Boy Scouts, whose members pick his brain on a variety of survival techniques. 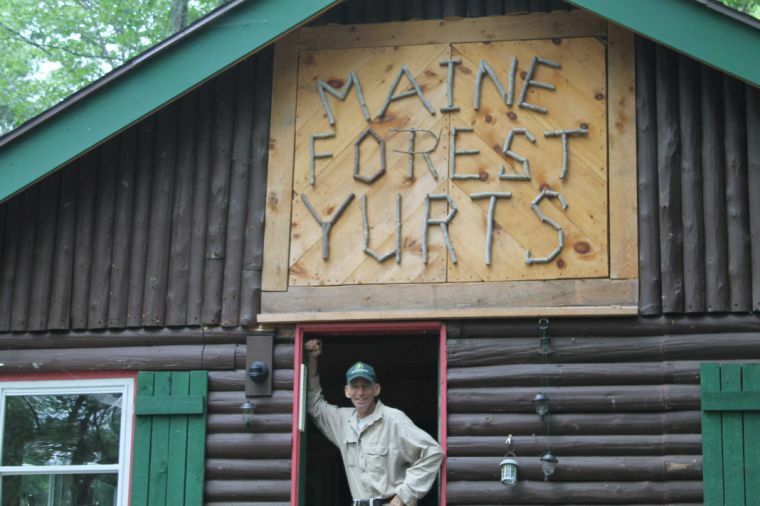 Maine Forest Yurts is a logical extension of his passion for the outdoors and hospitable spirit, and has provided a chance to have a family business with his wife and children. They have two sons, David, 31, and John, 30; and a daughter, Paige, 25. “It’s great working with your boys, a dream,” said Crowley, 61, who now splits his time between Durham and South Portland. Crowley envisions the Durham property becoming a destination for the considerable amount of “Survivor” fans and possibly a corporate retreat, where people can take part in team-building activities. He hopes to have the Durham Warriors Survival Project Challenge become an annual event and possibly allow for paying spectators eager to see a “Survivor” winner lead a group through the grueling four days of mental and physical challenges. “Some of what I have planned is a little malicious,” said Crowley with a laugh. The idea to honor veterans also represents a sea change in philosophy for Crowley, who was an active anti-war demonstrator in the 1960s. “Survivor” winner Bob Crowley puts the finishing touches on one of the challenges he is constructing on his 100-acre Durham property. Crowley will host the first Durham Warriors Project Survival Challenge, a four-day competition in September modeled after the rules of “Survivor.” All proceeds from the event will help cover the costs for veterans, active duty military, and other deserving individuals to stay for a weekend at Maine Forest Yurts, Crowley’s eco-friendly retreat, located on the same property. 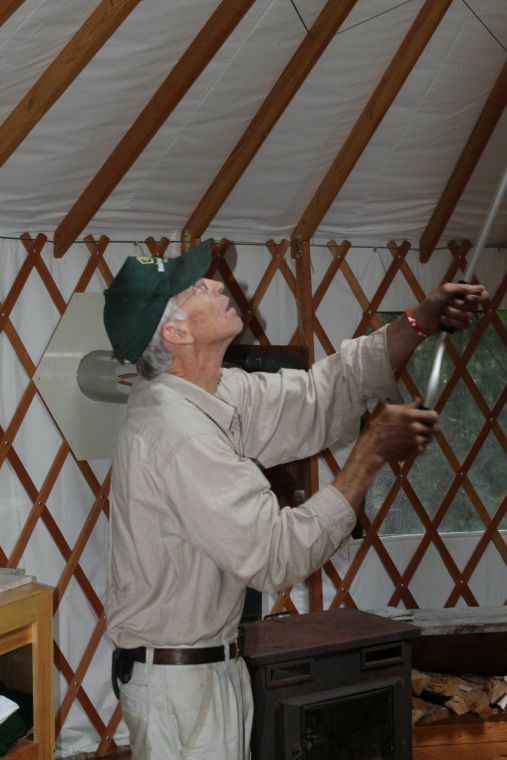 Bob Crowley manually adjusts the ventilation of one of his yurts, at the eco-friendly Maine Forest Yurts on Runaround Pond in Durham, where he will host the Durham Warriors Project Survival Challenge from Sept. 5-8. Bob Crowley relaxes in the doorway of the office to Maine Forest Yurts, on Runaround Pond in Durham. The “Survivor” winner will host a four-day charity event in September for military veterans through his nonprofit organization, Durham Warriors Project.